Nagle and Binh Dam ... strategic partnership. 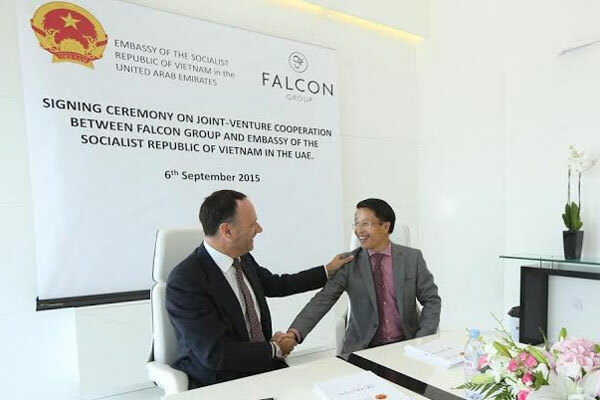 Falcon Group, a leading specialist financier, has entered into a joint venture co-operation agreement with the Government of Vietnam through the Embassy of Vietnam in the UAE aiming to promote both import and exports between the two countries. The UAE and Vietnam have established strong ties with the opening of the Vietnamese embassy in 2008. “In recent times we have sought to find a path toward further enhancing the flows between Vietnam and the UAE and we see Falcon Group as being an ideal partner, with their long and proven track record in the region,” said Vietnamese Ambassador Pham Binh Dam. “I am delighted that we are able to partner with the Embassy and believe that by cementing this agreement, we can work together in terms of business development programmes, and the sharing of our mutual expertise to further broaden the trade flows,” said Will Nagle, CEO of Falcon Group. “Vietnam is a relatively new market for us and we see great potential and opportunities in cooperating with established and respected Vietnamese companies – helping them grow both their cross border and domestic businesses,” he added. Falcon Group is one of the world’s largest independent providers of specialized financial solutions. The Group’s traditional focus is on providing bespoke trade finance solutions to their clients, targeting niche areas of trade finance covering a diverse range of industries including but not limited to soft and hard commodities, semi-capital goods, consumer goods and telecommunications equipment. Falcon has a global presence spanning Europe, Asia, Middle East, Australia and New Zealand and has, through the past four years, assisted in over $12 billion of business flows.